AirQ is Windows software that will collect, manage and display results from our range of environment sensors – collecting data on air quality information (TSP, PM10, PM2.5 and PM1) along with any external sensors such as pollutant gases and noise levels. Climatic conditions such as ambient temperature, wind speed, wind heading, and relative humidity can also be recorded as an aid to tracking the source of the pollution. For example, with AirQ a live on screen pollution rose can readily be created which plots measurements against wind heading on a polar chart. AirQ keeps a searchable database of results, so data can be picked out by sample, location and date. 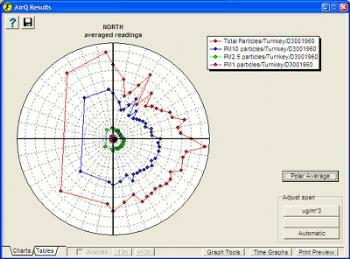 It can plot linear graphs of readings with time, or polar ones against wind direction. Theres also a built in function for creating reports from the data.